Before we know it, we are already in the 3rd week of Ramadan. How fast time flies, huh? How have your Ramadan been so far? I hope Allah blesses our deeds in this holy month. I've succeeded to fast thus far, alhamdulillah. There are a few days where I feel so tired but I persevered and managed to pull through. There was one day where I had a continued trial in Shah Alam Sessions Court and I could barely keep my eyes open during cross examination. Oh my God hearings and trials during puasa is a big no-no I tell you. Even on non-puasa days with the help of water and sweets I always feel sleepy during trial, what more now, right? When I went for my checkup 2 weeks ago, my gynae gave me the green light to fast. She said "only you know your body, how your body feels and as long as you feel fine, I don't see why you shouldn't fast." Alhamdulillah Allah hasn't made it a burden for me. Apart from the super duper sleepiness and the occasional hunger pangs, I feel OK.
On the first day of puasa, I made this Thai pumpkin custard. I saw the videos on Youtube and I felt like eating it. The sweetness and softness of the pumpkin married with the sweet coconut milk custard is just too good. 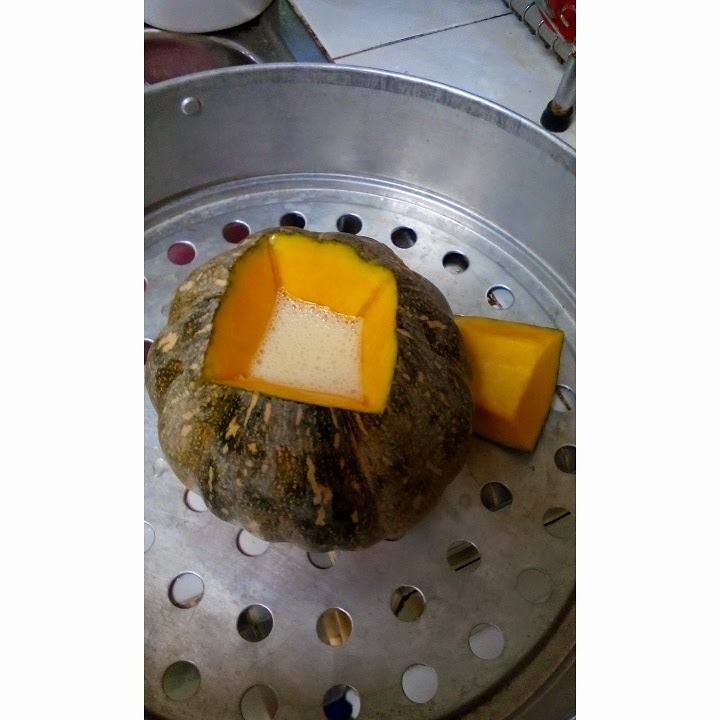 I bought a small pumpkin at a vegetarian cafe near my office. Unfortunately the custard didn't set even though I cooled the pumpkin in the fridge after steaming it. It poured out like a molten lava when I cut it. However, the taste was good. Maybe next time I shall try steaming it much longer. 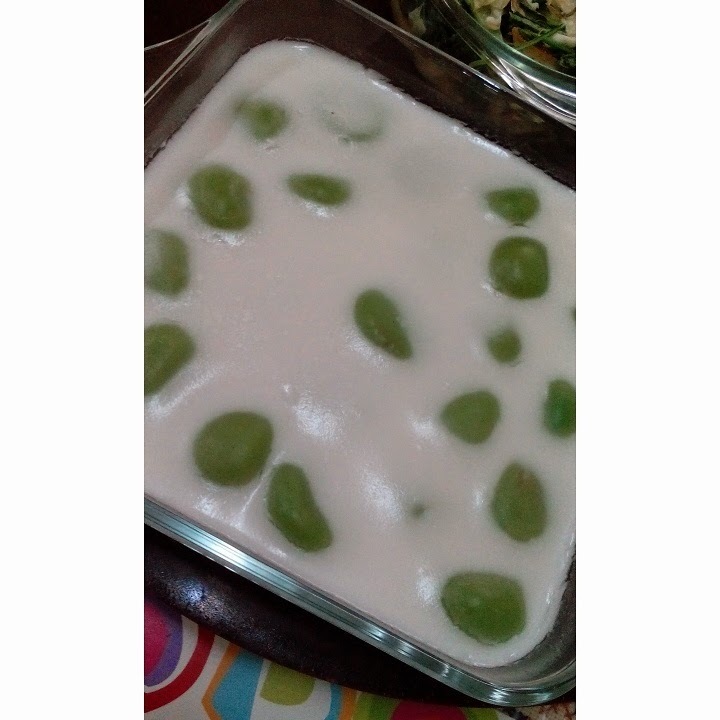 This kuih is called badak berendam. I made it during the second weekend of puasa. It took a bit of an effort to make it because you have to make the dough, turn them into balls, boil them and make the gravy. Luckily my mum already has some inti kelapa (coconut cooked with palm sugar) which she made earlier so it saved me one step of the process. It's hard to find this kuih selling anywhere that is why I made it. Even though I like baking cakes, it is also nice to learn how to make traditional kuih so that they will never be forgotten. The meaning of this is that you literally burn fat by consuming coconut fats (also coconut milk, coconut cream and coconut oil). These 3 researches from large medicinal journals are sure to turn the traditional nutrition world around!